At any moment, we are one heartbeat away from chaos. We think we have time, we think it won’t happen to us, or we don’t think about it at all. But without warning, strokes, accidents, diagnoses, and death happens every day. In the space of a heartbeat, we go from being fine to not being fine. The ICE PLAN Workshop is a three-hour interactive event that tackles this tough topic in an engaging way. Checkout at the top of the page. Who needs Legacy Family Planning? Why do you need Legacy Family Planning? According to a 20-year survey of 2,500 families conducted by The Williams Group, 70% of wealth transfers fail when measured by loss of assets. Sadly, the failure rate is closer to 90% when you include unnecessary upheaval and destroyed family relationships to the measurement of loss of assets. Legacy Family Planning is a repeatable formal process used by successful families to preserve family wealth and relationships in excess of 100 years. You don’t need Rockefeller’s wealth to leave a legacy for your family, you just need a plan. Over the next 30 + years, an estimated 30 trillion dollars will exchange hands as 68,000,000 baby boomers pass away. Based on historical data, over 85% of these transfers will fail, when failure is measured by (1.) loss of assets, (2.) unnecessary upheaval, and (3.) destroyed relationships. The impact of this looming crises threatens the smallest unit of society: the American family. When the real issue is recognized, a real solution can be implemented. Real solutions are found by identifying successful people, discovering what they do, and then doing what they do. When Cindy’s parents passed away 8 months apart, her family was destroyed. Becoming a grandmother galvanized her to protect her growing family. She discovered Legacy Families and their little-known estate planning tool. After successfully implementing a plan with her family, she launched the Legacy Family Revolution and wrote two best-selling books, Cur$e of Inheritance and The Legacy Family Way. Cindy’s passion is helping financially savvy family leaders create a Legacy Family Plan to transfer character before cash and ensure their family’s long-term future. 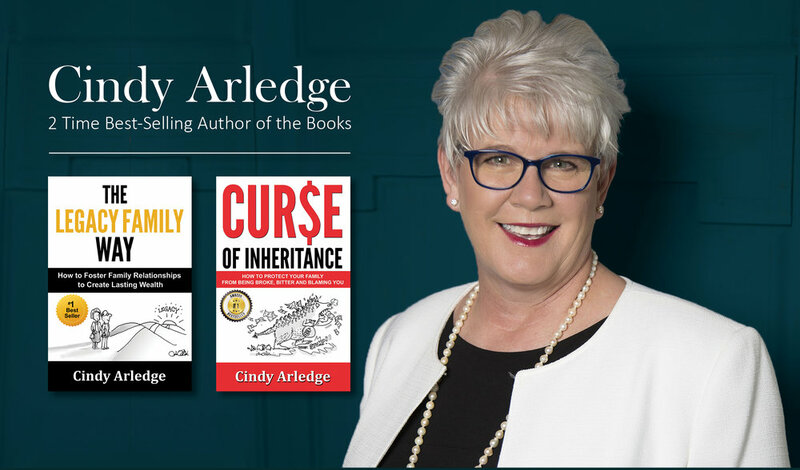 Armor Wealth and Angela's Crosswalk invites you to an evening with Cindy Arledge, Legacy Builder and Monster Tamer. Legacy Family Planning is the little-known, but critical estate planning tool that successful families use to foster family relationships to create lasting wealth. Space is limited, so be sure to register early!